Kew Combitester provides the ultimate in Microprocessor technology offering Loop and RCD tests with a comprehensive memory and downloading test results. • LOOP Impedance 200/2000Ω range measurement is carried out using a test current of 15mA. This current will not trip RCD’s rated at 30mA or greater. • High resolution for low Loop Impedance (resolution of 0.01Ω) on 20Ω range. • Direct reading of Prospective Short Circuit Current (PSC) and earth fault current. • RCD tests at 0 and 180 degree phase angle switch permit quick tests and consistent readings. Standard, Selective, AC and A (DC sensitive breakers). 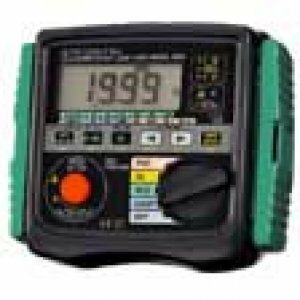 • Constant current source circuitry ensures that a fluctuating mains voltage does not affect the accuracy of readings. • RCD Ramp test in order to indicate the actual tripping current of RCD. • Contact Voltage Reading (UC). with two selectable contact voltage limits (50 and 25V). • Visual indication of correct wiring status and automatic lock-out if test resistors overheats. • Designed to IEC 61010-1, IEC 61557 and high protection degree IP54. • The stored data can be transferred to PC via Optical Adapter Model 8212-RS232C and 8212-USB.